Historic Chama, in Rio Arriba County, is nestled at the southern end of the San Juan mountain range near the continental divide. It's located at 8,000 feet near the Colorado border and served by State Highway 17 near US Highway 64. It's about 60 miles north of Santa Fe and 160 miles north of Albuquerque. 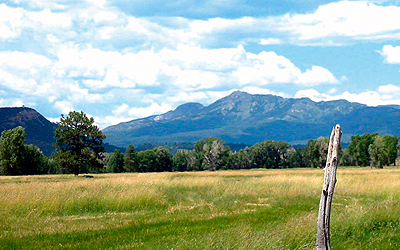 At an elevation of 7,850 feet, the Chama Valley is New Mexico's premier alpine wilderness. With 300 days of sunshine, our enchanted valley provides plenty of opportunity to enjoy the great outdoors! We invite you to contact United Country Northern New Mexico Real Estate, Inc. can save you time and money locating properties in throughout northern Rio Arriba Country, New Mexico...including Abiquiu and the Chama Valley.